If you are visiting in the summer, or even spring or autumn, you may be tempted to have a city-and-beach holiday – Lisbon coast beaches are blessed with fine golden sand swept clean by Atlantic tides even if a little colder than the Mediterranean! 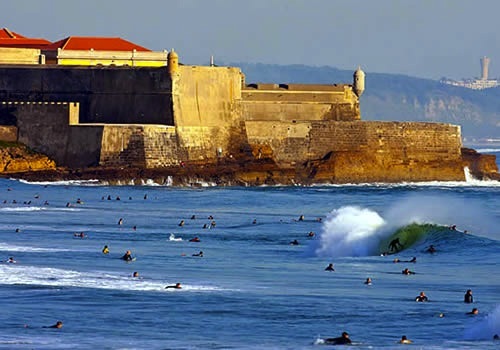 A very popular beach, CARCAVELOS has a huge fortification called Forte de São Julião da Barra to the east side of beach, used to protect the Tagus’ entrance from enemy ships once upon a time. As well as being swim friendly, it features several beginner surf schools, beach soccer and several surfer style bars and hangouts, making it especially popular with teens and twenty-something’s. 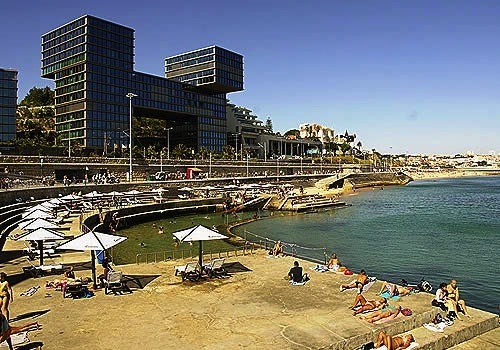 Carcavelos beach is located approximately 600 meters south of the train station. 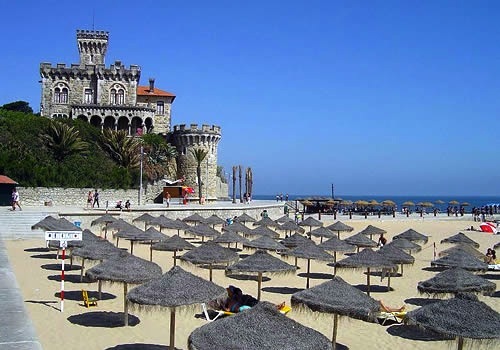 PRAIA DO TAMARIZ is situated at ESTORIL just before you get to Cascais along the “paredão” – a scenic pedestrian walkway that runs along the seaside and is lined with cafes, restaurants and bars, as well as featuring public benches and exercise stations, showers and public wc’s. Walkers exercise along this seaside walkway at all times of the year and it is also illuminated at night, so a day at the beach day can easily stretch into an evening out. The beach here is very cosmopolitan and popular with tourists and locals alike in the summer, overlooked by palatial homes and high-end hotels as well as being located near the Casino do Estoril – the Linha de Cascais was colonised by Europe’s exiled royalty during the first half of the 20th Century and elegant Estoril, became one of the world’s chicest addresses during the inter-war years! There is also an ancient and still used, tidal rock and sea water swimming pool at Estoril. At the end of the rail line is CASCAIS, an old fishing village turned into holiday resort with an international marina well worth exploring by foot (or bicycle or Segway as per previous post). 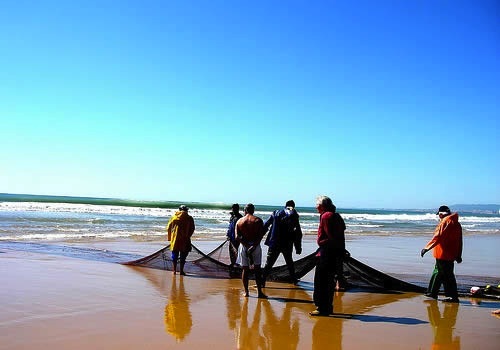 Tucked between the main square and the Atlantic Ocean, the tiny PRAIA DO PESCADOR or RIBEIRA is not considered good for swimming as it is still actively used by fishermen. 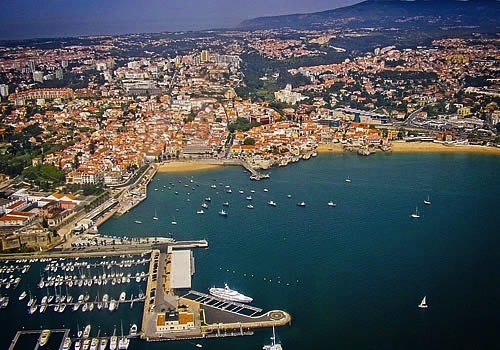 But continue walking through the central square heading southeast through Cascais and you will pass PRAIA DA RAINHA, a minuscule pocket of sand sitting between rocky cliffs and multi-million dollar mansions. Then walking on a little further east, you will come to PRAIA DA CONCEIÇÃO – this much wider strip of golden sand is the most popular of Cascais beaches and where the “paredão” walkway also starts. The beach has good facilities including some beach wear shops and restaurants, making it the perfect place to spend a day lying in the sun, eating, and people watching. At times somewhat windswept but nevertheless stunning, GUINCHO (between Cascais and Sintra) also has strong waves, making it perfect for surfing sports but not so great for swimming. 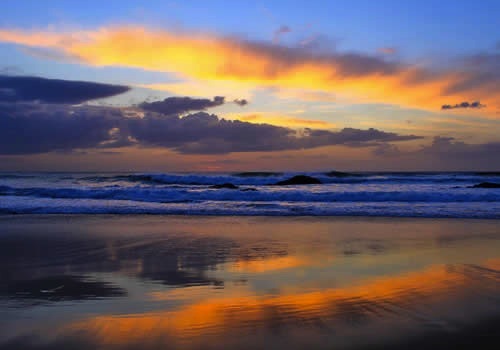 Windsurfing, kite surfing and surfing types will love it however, and the sunsets from this wild coast are spectacular! There are few friendly beach bars serving food and beverages. GETTING THERE: Guincho is located 5 km away from Cascais station by bus. Alternatively drive there from Lisbon along the A5 motorway, exiting at Cascais, following directions to Birre and then Guincho. 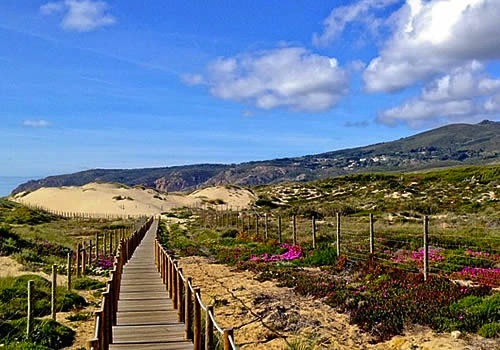 After passing the village of Areia and a campsite on your left, you will see the coast in front of you. Turn left onto the coast road and park near Muxacho hotel and restaurant; or turn right and continue uphill for another 500 metres or so, turning left onto a dirt road signed posted Praia do Abano, which will take you to the Praia do Guincho car park and the main access to the more sheltered area of Guincho and a great beach restaurant. Car parks in this area are charged. 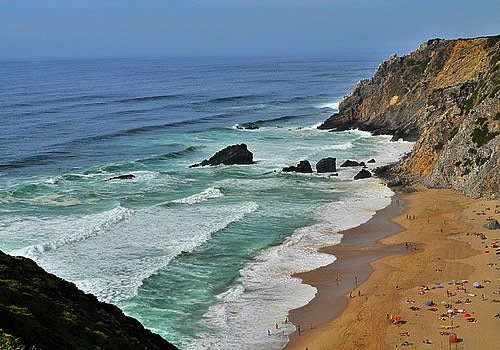 Considered among the most beautiful beaches in Europe, PRAIA DA ADRAGA, close to Sintra and 15kms north of Guincho is truly a nature lover’s beach – it is far from the maddening crowd and its secluded behind tall cliffs, with strong breaking waves and very clear blue water! GETTING THERE: A car is essential and a map desirable! Drive there from Lisbon along the A5 motorway, exiting at Malveira da Serra, then follow the N9 road north passing Aldeia do Juso; and then the N247 passing Azoia, Ulgueira and Almoçagene. The beach is sign posted from here onwards. COSTA DA CAPARICA immediately south of the river Tagus , is essentially a 30 km long stretch of sand but some patches can get crowded at weekends, with traffic jams to and from Lisbon making access difficult. My trick is to leave Lisbon before noon (the Portuguese are late risers) and to return after watching the sunset! Although a continuous beach, Caparica is subdivided into different areas, offering something for everyone, from family restaurants and small cafes, to more club like beach bars with live music and summer parties galore hosted late into the night. At the end of the afternoon local fishermen sell the excess fish catch on the beach. Surrounded by dunes, my favourite spots in Caparica are surrounded by dunes and offer a little extra – PRAIA DO CASTELO has a small beach hut and blaring music more popular with the young-at-heart and surfers type; whilst PRAIA DA MORENA is more popular with families, with sun loungers/shade for hire and quite a sophisticated restaurant specializing in fresh fish and a delicious white wine sangria! GETTING THERE: Buses depart from Lisbon’s Praça de Espanha bus terminal to Caparica town, only a 5-minute walk from the start of this long stretch of beach. 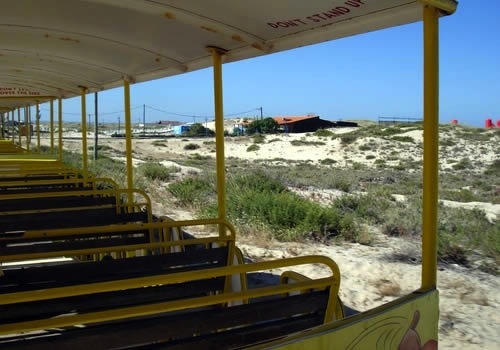 In the summer season, a little open-air train connects Caparica to the various beach spots along the coast – ring the bell to stop at the beach of your choice (stops are numbered). If you are driving there yourself, cross the river Tagus on the Ponte 25 Abril and take the first exit to Costa da Caparica. As you approach Caparica town, turn left at the traffic lights and follow the signs to Praias and Fonte da Telha. Keep driving on along this road (similar to an African country with its shambolic urban planning) and you will soon see various beach signs to the right hand side including Praia do Castelo and then Praia da Morena, a bit further along. PRAIA DO MECO, the nudist beach, is located 40 km south of Lisbon, adjacent to the Serra da Arrabida Natural park – it is secluded and one of Lisbon’s cleanest beaches, with high cliffs and lovely bay views. It became popular in the 1970s as one of the first nudist beaches but this reputation continues today with evermore European nudists flocking to it, but there are also some traditional family beach sections. The beach is located by a traditional fishing village of the same name which is very popular with artists and media personalities, so it offers a good range of restaurants and bars, well worth hanging out at after the beach – plan a whole day way! GETTING THERE: A car is essential and a map desirable! Departing from Lisbon cross the river Tagus on the Ponte 25 Abril heading south towards Setubal, but exit the motorway where sign posted Sesimbra. Follow the N378 to Alfarim rather than Sesimbra; and from the village of Alfarim, follow directions to Praia do Meco. RED for danger – do not bathe; YELLOW for be very careful; GREEN for safe, BLACK & WHITE for beach unattended. 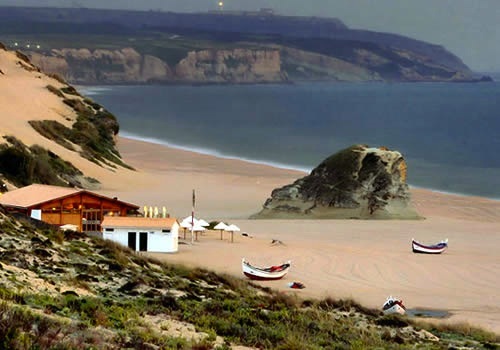 Keep in mind too that all beaches in Portugal, however remote, get crowded in July & August! This entry was posted in Daytripping, Lisbon, Transportation.